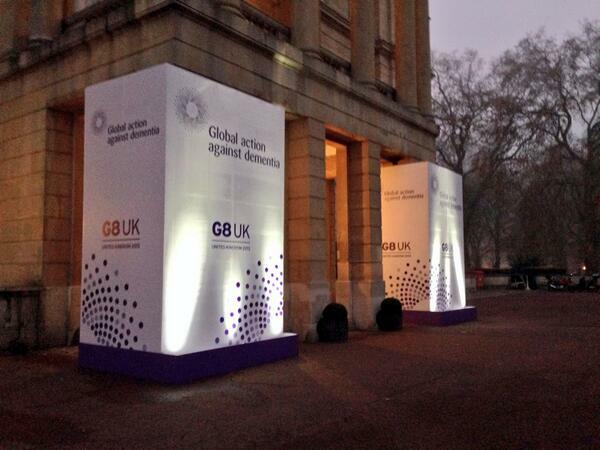 The setting for today’s #G8Dementia Summit was in Lancaster House, London. Many thanks to Beth Britton, Ambassador for Alzheimer’s BRACE and campaigner, Anna Hepburn at the Department of Health, and Dr Peter Gordon, Consultant and expert in dementia, for helping understand, with the excellent livestream from the Department of Health, what challenges might be in store for global dementia policy in the near future. The final G8 Summit Communique is here. The G8 Summit Declaration is here. There’s a bit of a problem with global dementia policy. The patients, carers, families, businesses, corporate investors, charities, media, academics (including researchers) politicians, all appear to have different opinions, depending on who you speak to. Peter Dunlop, a man with dementia of Alzheimer type, received a standing ovation after his speech. He had explained his reactions on receiving a diagnosis, and how has tried to continue enjoying life. He had been a Consultant Obstetrician and Gynaecologist. The people with dementia who appeared did indeed remind the audience, including Big Pharma, why they were there at all. And the carers were listening carefully too..! There was some concern aired that the volunteers and charities would been seen as a valid alternative for a properly supported health and social care system. Whilst everyone agreed that ‘dementia friends’ and ‘dementia friendly communities’ were worthy causes, everyone also agreed that these should not replace actual care. Part of the aim of today was to foster of culture of diminishing stigma. And yet the media had been full of words such as ‘cruel disease’, ‘robs you of your mind’, ‘horrific’. So the politicians seem conflicted between this utter armageddon and wishing to destigmatise dementia, with generally pitiful results. Some of the language in the last 24 hours has indeed been truly diabolical. I took a break to watch the main news item on the BBC, and Fergus Walsh was heading up the main item on dementia with extremely terrifying language. But the Summit kept on reverting to the ‘real world’, pretty regularly though. A pervasive theme, brought up by many health ministers and other interested parties, was how dementia carers themselves needed supported. Dr Margaret Chan even later in the day spoke about a new online resource for carers, which would be fantastic. ‘We’re going to develop an online resource to help carers.” Dr Margaret Chan @WHO #G8dementia This is indeed brilliant news. An aspect of why this situation had arisen was not really explained. Prof Martin Rossor, Honorary Consultant for the Dementia and Cognitive Disorders unit at Queen Square, described the dementia issue as ‘a wicked problem’ on the BBC “You and Yours”. However, Dr Margaret Chan from WHO was much more blunt. Big Pharma had failed to ‘come up with the goods’, despite decades of trying. But few speakers were in any doubt about the societal impact of dementia, though much of the media resorted to scare tactics as usual in their messaging. The speakers on the whole did not wish to discuss how care for people could be reconfigured. The disconnect between the health and social care systems is clearly a concern in English policy. And indeed this was even raised. All was not lost regarding wellbeing. Hazel Blears, Labour MP for Salford, explained how her mother was living with dementia, so it was vital that policy should do everything it could do to help people live with dementia. I met the Salford Institute for Dementia, a brand new Twitter account, for the first time this afternoon, which was in fact one of the highlights of my day. Although not pole position compared to ‘cures’ and ‘disease modifying drugs’, it was clear that the #G8summit were keen to support assistive technology, telecare and telemedicine. This could be in part due to the generous research grants from various jurisdictions for innovation, or it could be a genuine drive to improve the wellbeing of persons living with dementia. At just before lunchtime, I suddenly “twigged it”. I must admit I was angry at myself for having been “slow on the uptake”. As it was, the discussion appeared to swing periodically between two ends of an extreme during the course of the day. At one end, the discussion was about ‘big data’ and ‘open data’ sharing. Vivienne Parry , then said how she preferred the term ‘safe data’ to ‘open data’, but Twitter was at that point awash with queries as to whether a rose by any other name would smell as sweet? People conceded the need for persons and patients voluntarily to contribute to these data sets, and for international organisations such as WHO to attempt to formulate standardised harmonised templates for these data. At the other end, people were very keen to talk about genetic information, presumably DNA, being the subject of DNA genomics data scrutiny at a personal level. Also, the discussion itself swung from personal tales (such as Beth Britton’s) to a discussion of looking at societal information as to what sorts of data clusters might show ‘susceptibility’ in their genetic information decades before the onset of clinical dementia. Big data, like 3D printers, has been identified as ‘the next big thing’ by corporates, and it’s no wonder really that big data should of interest to big Pharma corporates. Having failed spectacularly to have produced a cure or disease-modifying drugs across a number of decades, Pharma are left with two avenues. One is that they look at the individual response to therapy of drugs at a single case level using radio-active binding studies (radio-ligand binding studies), and monitor any slowing of build-up of abnormal protein in the brain as a response to treatment. How much this actually benefits the patient is another thing. Or Big Pharma can build up huge databases across a number of continents with patient data. Researchers consider this to be in the public interest, but patients are clearly concerned about the data privacy implications. And of course this agenda was very much helped by Sir Mark Walport being so enthusiastic about data sharing. Having been at the Wellcome Trust, his views on data sharing were already well known though. If it were that regulators could allow data sharing more easily, justified presumably on public policy grounds such that freedom of information was more important than data protection according to the legal doctrine of proportionality, this plan could then considerably less risky for corporate investors wishing to invest in Big Pharma. Andrea Ponti from JP Morgan gave this extremely interesting perspective, which is interesting given the well known phenomena of ‘corporate capture’ of health policy, and ‘rent seeking behaviours’ of corporates. It has been argued that waiting for valid consent from the patients would take too long, so presumed consent is more of a practical option. However, this ethically is an extremely tricky argument. The Pharma representatives were very keen to emphasise the ‘free flow’ of data, and the need to ‘harmonise regulation'; but they will be aware that this will requiring relaxing of the laws of more than one country. Some of the tales were truly heart-breaking. But I was happy because Beth was happy at the reception of her film. She is so utterly passionate, and totally authentic, about the importance of her father who had dementia. It was a privilege for us to see how well the film had been received by all there at the #G8summit. And those pesky tweets kept on coming…! But indeed there was a lot to be positive about, as research monies if well spent could provide a cure or disease-modifying drugs. Big Pharma and the researchers know that they are not only trying to tackle the big one, the dementia of the Alzheimer type, but also other types such as the vascular dementias, frontotemporal dementias and diffuse Lewy body disease. Beth’s input today was invaluable. And Dr Peter Gordon loved it! It smelt like a corporate agenda. It looked like a corporate agenda. It sounded like a corporate agenda. All the ingredients of ‘corporate capture’ were in attendance: big data, personalised medicine, genomics, data sharing. They’d have managed a full house had the world leaders found a use for 3D printers in all of this. Previous Article Is a new sophisticated brain scan desirable to diagnose dementia? Shibley thanks so much for this as we lost all internet connections from 8am until late afternoon…very odd indeed as not happened ever before! Glad to read this and catch up on all I missed.